Año Nuevo is two, or three, parks in one. On the Pacific side of Highway 1 lies the Año Nuevo Coast Natural Preserve. 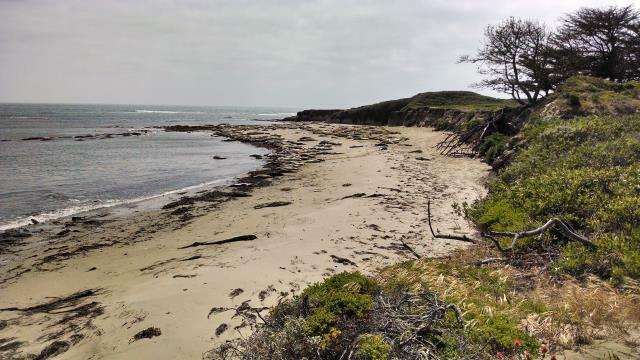 One of the two sections of the preserve has restricted access to protect the Elephant Seals that beach upon the shoreline here. A view of the trail before things get sandy. The house on Año Nuevo island can just be made out in the distance. The Elephant Seals are the park's main draw. After being driven to the brink of extinction by hunters for their blubber, the seals made a slow comeback after obtaining protection from Mexican and American governments in the early 1900's. Elephant Seals did not reappear here until the 1950's, first on Año Nuevo Island and then a decade later on a couple of beaches on the mainland. The more popular North Point site is more desirable by elephant seals and tends to sport more individuals that the other two beaches. There are three separate viewing points from which visitors can watch the seals as they lumber onto and rest on the beach. North Point viewing site, farthest from the trailhead, tends to be the best. The thinking is that the steeper bluff overlooking the beach here provides the seals better shelter from the wind and safety from land based predators. During peak season the three areas merge into one near continuous line of seals totaling up to 10,000 individuals. Quieter times may see a few hundred animals. A volunteer docent at each viewing area is on hand to answer any questions about the elephant seals. They may even have a few photos and props to show in order to illustrate a point. Visible from the shore is Año Nuevo Island. Between 1872 and 1948 various forms of navigation aids were installed, including fog whistles and light towers. The rocky shores, often enveloped in fog, proved to be a dangerous impediment to coastal ship navigation. A large light keepers residence and support buildings were constructed and are still visible. When an automated navigation buoy was installed in 1948, then need for a permanently manned station disappeared and the structures have been left to decay. A closer view of Año Nuevo Island. Off limits to visitors, this is as close as you'll get to the deteriorating light keeper's house and other structures. The trails near each of the three viewing areas becomes very sandy and a bit steep at times. Staked ropes guide hikers along the proper route around large sand hills. Large ants crawling on the sand are at times blown by the wind hard enough to send them tumbling. It doesn't seem to disorient them too much as they quickly get back on their way. Just north of the Elephant Seals beaches lies the remainder of the natural preserve part of the park. A few trails run along the Atkinson Bluff overlooking the beaches below. A few access points allow walkers access to the water below. Some of the buildings are the trailhead of the Año Nuevo Coast Natural Preserve's restricted area are the remnants of a dairy farm that operated here from the 1800's through World War II. 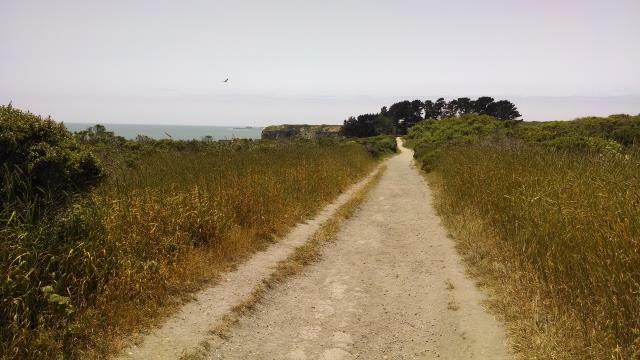 On the opposite side of Highway 1 from the coastal preserve lies Año Nuevo State Park. Formerly part of the Cascade Ranch, this area was added to the park in 1985. A few trails here ascend into the range overlooking the shore. Farther inland, the park even comes into contact with two additional state parks, Big Basin Redwoods and Butano. Coppertone and I came to Ano Nuevo to see the elephant seals and were happy to find that we got here when the preserve part of the park was open without having to arrange for guided tours. 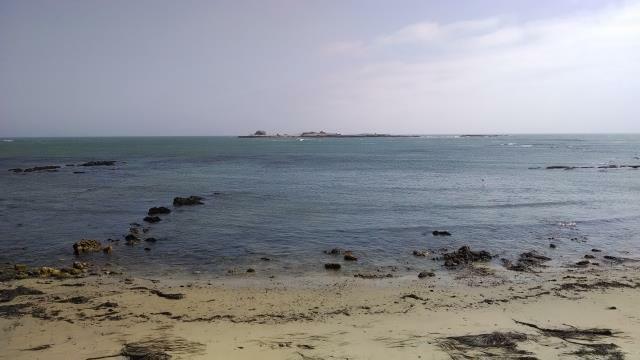 The were about 400-500 seals on the beaches at three overlooks. Most of them females and juveniles. The seals were molting, so many had some bits of fur hanging on that they'd not yet managed to rub off. The last mile of the Ano Nuevo Point Trail before the overlooks to view the Elephant Seals becomes very sandy and rather tough going. Definitely not ADA accessible and a bit of a workout.